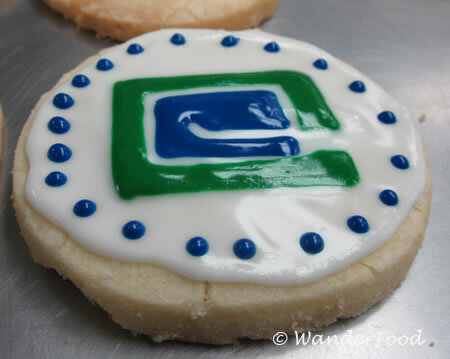 In honor of the final game of the Stanley Cup Playoffs, here’s a cookie with the Canucks’ logo on it. During a tour of the Pacific Institute of Culinary Arts in Vancouver over the weekend, the students there were busy whipping out versions of this cookie prior to game 5. I didn’t get to taste one but I still cheered on the Canucks that night (to a win, by the way). That night, the streets filled up with screaming fans that kept me awake very late that night – despite me being on the 15th floor of my hotel.